The Lovecraft series with another one of his heavy, i.e. “primary” revisions. This one has a tie to another frequent subject of this blog: Ambrose Bierce. De Castro and Bierce collaborated on one work (which I have not read): “The Monk and the Hangman’s Daughter”. Raw Feed (2005): “The Last Test”, Adolphe de Castro [and H. P. Lovecraft], 1928. This story has a curious pedigree. It originally showed up in an 1893 collection of Castro, and then, says S. T. Joshi, Lovecraft rewrote it completely. 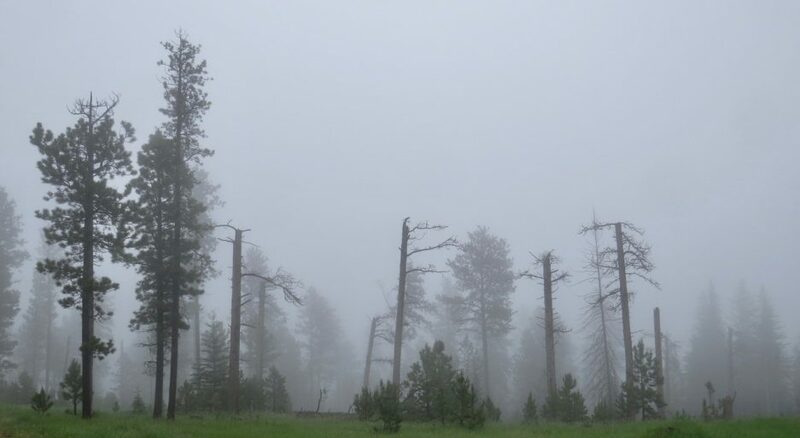 The original plot skeleton explains the presence of a woman character and a frustrated romance between the Governor of California and the sister of a mad scientist — both elements very untypical of Lovecraft. But some of the Cthulhu gods are mentioned, and I suspect the presence of Surama and the Thibetans is a Lovecraft addition. I liked the idea that the black fever may have extraterresterial orgins. The vernacular and language of the tale is more mainstream than a lot of Lovecraft. I’m curious if Lovecraft did his revisions quicker and with less care than stuff appearing under his own name or if he tried to match the style of his client. More Lovecraft related reviews are on the Lovecraft page. Since I’m off preparing new stuff, you get this retro review, from November 10, 2012, of an obscure tome. Review: The King in Yellow, Robert W. Chambers, 1895. The sole title he’s is now recognized for is The King in Yellow. Like most literary works, it was drifting into the dark and cold zone of cultural oblivion. Then he was caught in the gravity well of that coalescing star of weird fiction, H. P. Lovecraft. And, once illuminated by Lovecraft’s in his Supernatural Horror in Literature, this work became sort of a bright satellite beckoning Lovecraft fans to explore it. But Chambers’ book is one of those moons with only one face of any interest. An unproductive day new writing-wise, so you get a retro review from June 12, 2009.
Review: The Fantasy Hall of Fame, eds. Robert Silverberg and Martin H. Greenberg, 1983. The reputations of some of these stories and that of their authors may have waned in the 26 years since this anthology was published. None of the stories are bad though a few aren’t that special. 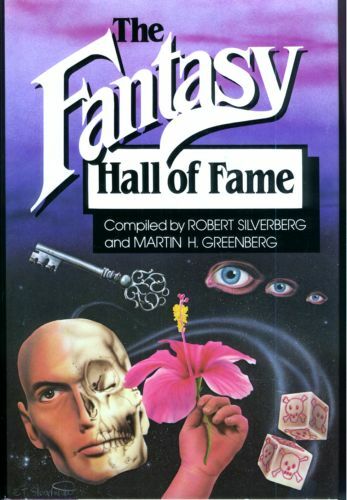 The stories were selected in a manner similar to the Silverberg edited The Science Fiction Hall of Fame, Volume One. Attendees of the World Fantasy Convention chose stories to honor that were published before the convention begin doing their annual awards. The stories are arranged chronologically, and the first is Edgar Poe’s “The Masque of the Red Death” (1842). This classic tale of a plague, mysterious colors, and death coming to a cloister of aristocrats is the grandfather of all those far future tales of decadents on a dying Earth. Poe influenced the prose and poems of Clark Ashton Smith, but the influence isn’t very evident in the latter’s “The Weird of Avoosl Withoqquan” (1932). It’s a story of an avaricious man who hears an ominous prophecy from a beggar he snubs. Smith’s Zothique series, very definitely a series of far future decadence, is not represented here directly, but it’s certainly echoed in Jack Vance’s “Mazirian the Magician” (1950), part of Vance’s Dying Earth series. In a story full of Vance’s exuberant palette of colors and exquisitely named magic, a sorcerer determines to possess a woman who has avoided him. I read a few stories in September, so I could get more out of a one hour convention panel celebrating Bierce and the (probable) 100th anniversary of this death. I couldn’t just read the stories, though. Those Civil War stories and memoirs in between the covers of Ambrose Bierce: The Devil’s Dictionary, Tales, & Memoirs looked interesting. And I had plenty of time left before returning it to the library. And then it was interesting enough to buy my own copy. And then I find out that Mr. Joshi co-edited a whole bunch of Bierce satires in the vein of his “Ashes of the Beacon” and “For the Ahkoond”. So I bought that. And read it cover to cover. 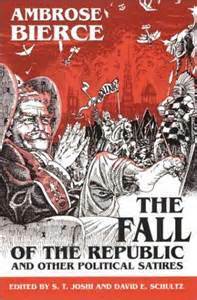 Review: The Fall of the Republic and Other Political Satires, eds. S. T. Joshi and David E. Schultz, 2001. As I said when last speaking of Bierce, death is Bierce’s usual punch line.